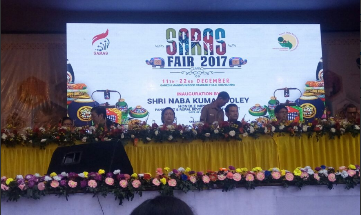 Assam Panchayat and Rural Development minister Naba Kumar Doley on Monday inaugurated the SARAS Fair at the Ganesh Mandir Indoor Stadium Field, Khanapara here. The fair is being organised by the Assam State Rural Livelihoods Mission. Speaking at the event the Minister said the event will provide a platform to the rural artisans to showcase their skills and products. He expressed hoped the Fair will not only display the products of the rural artisans and craftsmen but will also enable them to interact and learn from the other participants from different states. The Minister also flagged off a mobile awareness campaign named ‘Awareness on Wheels’ during the inaugural session. SARAS Fair initiative is to market rural products thereby providing an opportunity for income generation to the rural artisans. The objective of the scheme– Sale of Articles of Rural Artisans Society (SARAS)–is to create awareness about rural products among the urban population and to develop new business opportunities for the rural artisans/ SHG’s. The Fair has about 100 stalls across 17 States starting from and is expected to attract huge crowd and buyers. Commissioner and Secretary Dr. J.B Ekka, Director SIPRD A.M.M Zakir, Director, NIRD & PR, Northeast Regional Centre R.M Pant, State Mission Director Nandita Hazarika and other dignitaries were present in the inaugural session. The twelve-day event will not only display and sales of Handloom and handicraft items but will have interactive sessions and workshops related to entrepreneurship development, skilling of youth, leadership building, health and nutrition of women and children and scientific methods of livestock management.